A fine tooth locking ratchet for heavy-duty jobs. Lang large hose clamp pliers are for use on flat type hose clamps. Lang Hose Pinch-Off Pliers squeeze hoses shut, and jaws swivel fo parallel clamping. Lang Small Hose Pinch Plier is designed with a self-locking feature that holds after pressure is applied, to release pressure simply pull plier handles apart. Pliers are used to seal vacuum hoses and the offset design allows more access in tight areas. Lang Medium Hose Pinch Plier is designed with a self-locking feature that holds after pressure is applied, to release pressure simply pull plier handles apart. Pliers are used to seal vacuum hoses and the offset design allows more access in tight areas. Lang Large Hose Pinch Plier is designed with a self-locking feature that holds after pressure is applied, to release pressure simply pull plier handles apart. Pliers are used to seal vacuum, fuel line and radiator hoses plus other flexible materials. Lang Large Hose clamp pliers. For use on flat type hose clamps. Lang Hose clamp pliers. For use on Corbin type hose clamps. Lang Hose clamp pliers. For use on flat type hose clamps. Lang Angled Hose clamp pliers. For use on flat type hose clamps. The 3444 Lang Large Hose Clamp Pliers is one of thousands of quality tooling products available from MRO Tools. 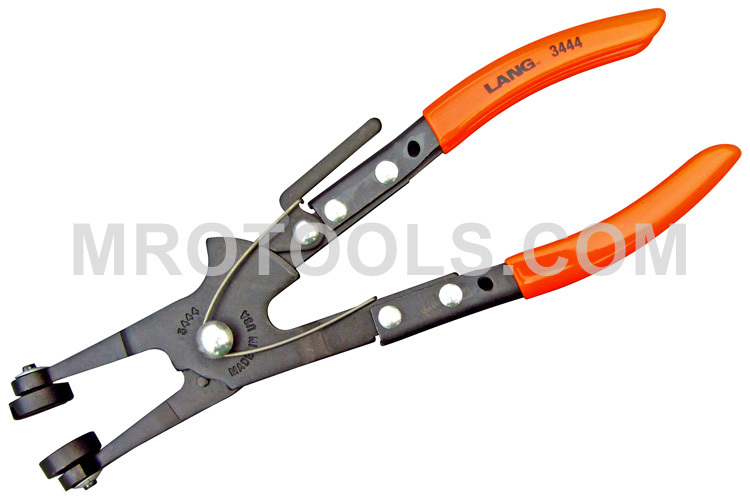 Please browse Lang Hose Pliers for tools similar to the 3444 Lang Large Hose Clamp Pliers. 3444 Lang Large Hose Clamp Pliers description summary: Lang Large Hose clamp pliers. For use on flat type hose clamps. Quantity discounts may be available for the 3444 Lang Large Hose Clamp Pliers. Please contact MRO Tools for details.